Tuesday, Nov. 22, at 7 p.m. 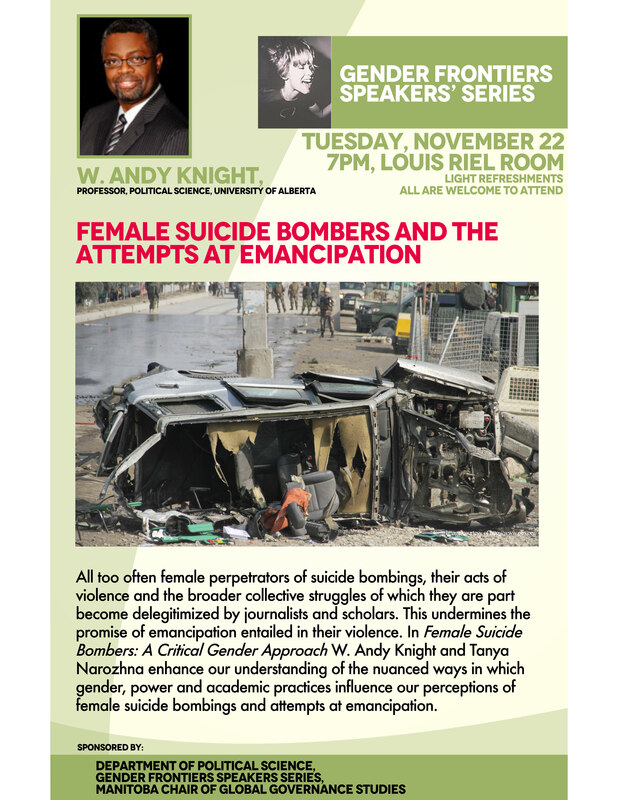 The department of Political Science at Brandon University, in conjunction with the Gender Frontiers Speaker Series and the Manitoba Chair in Global Governance, is proud to organize a talk by Dr. W. Andy Knight from the University of Alberta to launch his new book on female suicide bombers. 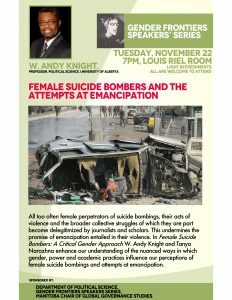 Dr. Knight, who co-authored “Female Suicide Bombings: A Critical Gendered Approach” with Tanya Narozhna (University of Winnipeg), will explore the complex intertwinement between power, knowledge, identity, legitimacy and violence that are expressed through suicide bombings carried out by females. All too often, he notes, female perpetrators of suicide bombings, their acts of violence and the broader collective struggles of which they are part become delegitimized by journalists and scholars. This undermines the promise of emancipation entailed in their violence. Political violence, Dr. Knight argues, can be emancipatory. Anticolonial struggles in Africa and elsewhere demonstrate that it can free people from certain oppressive structures. Does it matter then who carries it out and how? Does it make any difference if a group of men hijacks an airplane or a woman blows herself up in the midst of a crowded market square if in both cases the intent is to bring about emancipatory change? Having examined over 300 cases of female suicide bombings in various conflicts, Knight and Narozhna argue that the form of violence and the identity of a perpetrator do matter a great deal. Dr. Knight is former Director of the Institute of International Relations at The University of the West Indies and Professor and former Chair of the Department of Political Science at the University of Alberta. He served as a Governor of the International Development Research Centre from 2007 to 2012 and was Principal Investigator for a major Social Sciences and Humanities Research Council of Canada grant to study Children affected by war. Professor Knight co-edited Global Governance journal from 2000 to 2005 and was Vice Chair of the Academic Council on the United Nations System. He is also a Fellow of the Royal Society of Canada. All are welcome to attend his talk, which will begin at 7 p.m. on Tuesday, Nov. 22 in the Louis Riel Room near Harvest Hall at Brandon University. Light refreshments will be provided.